The new installation of Wellness Walls for Art, More Quilting, Carving, and Printing Too!, features the combined themes of quilting, carving and printmaking with new work from the West Alabama Quilters Guild, poster artist Isadora Bullock and selected letterpress posters by Amos Kennedy. The exhibition runs through January 14, 2016, at the University Medical Center, which is open Monday through Friday, 8:00 a.m. to 5:00 p.m. 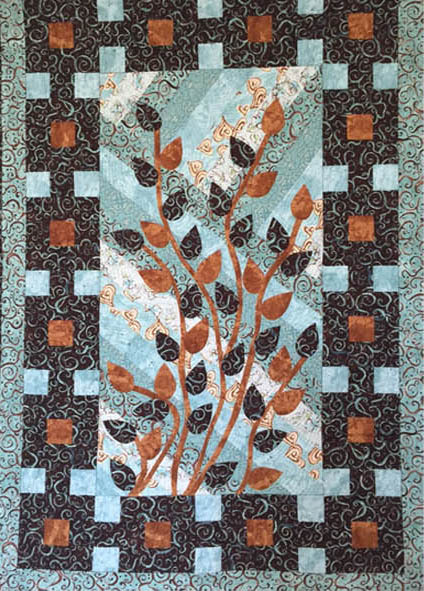 Established in 1991, the West Alabama Quilters Guild (WAQG) promotes the appreciation of quilts, shares knowledge about quilts and quilting and performs community service projects. Over the years, they have made hundreds of charity quilts for neighbors and individuals receiving services through local organizations such as the Ronald McDonald House, Tuscaloosa County Department of Veteran’s Affairs, Tuscaloosa County Sheriff’s Department, Tuscaloosa Children’s Center and Turning Point of West Alabama, to name a few. Every October, members of WAQG demonstrate quilting techniques from their booth at the Kentuck Festival of the Arts. They also host an annual workshop with nationally known quilters, as well as quarterly mini-workshops on quilting techniques. The group meets on the second Saturday of each month at the Tuscaloosa Department of Transportation. Isadora Bullock, a Tuscaloosa native and a BFA graduate of the UA Department of Art and Art History, continues her work of designing posters for music events from her home base of Asheville, NC. 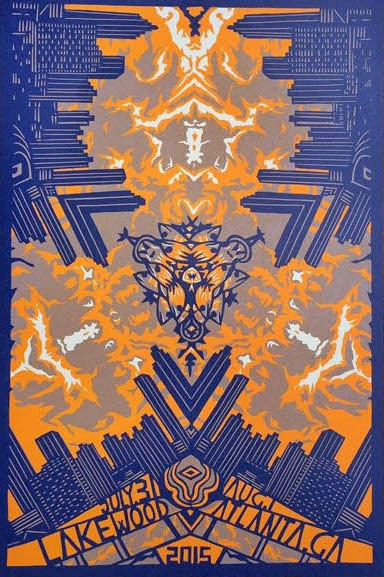 Now a full-time printmaker, her artistic process is complex, carving successive layers of linoleum blocks to create limited editions of prints that most often celebrate the music and venues of the rock band fish. Her dynamic, award-winning designs are prized for their incredible detail and the incorporation of references to Phish. Her work, including her cover art and poster for Holly Bowling’s album Distillation of a Dream, can be found on her website, isadorabullock.com. Wellness curator Deborah Hughes said she first encountered the posters of internationally known letterpress artist Amos Paul Kennedy Jr. at Rooster Days Art Festival in York, Alabama, more than a decade ago. For several years she has been delighted that Kennedy graced the Kentuck Arts Festival, cheerfully demonstrating his art and rolling out prints with messages in words both amusing and thought provoking. Hughes was surprised to next encounter Kennedy’s posters in one of the most prestigious galleries in Santa Barbara, California. She remarked that he is sometimes regarded as a talented folk artist, but defies any label or profile, adding with a laugh, “He sure does get around.” Kennedy is currently based in Detroit, but his work can be purchased through gallery affiliations across the country and in Italy and Switzerland. Find the complete release at http://art.ua.edu/news/exhibition-emphasizes-handmade-artwork/.